This is my first post on this site so I hope the photo comes out okay. 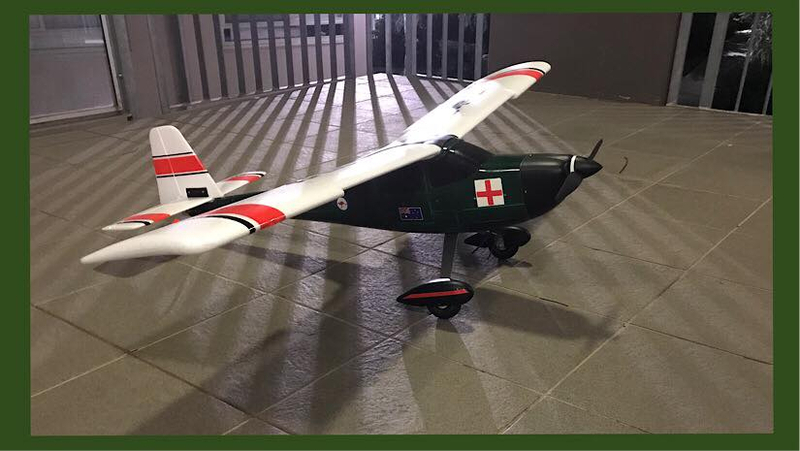 I haven't yet had the chance to fly my rc aircraft at my rc club yet due to health reasons which required sometime in hospital. The plane in the photo is my TrainStar 1400mm model that I purchased from HobbyKing which I painted my own colours for my own taste. I suppose the fact that I am new to RC aircraft I have learned some lessons the hard way such as removing the propeller when working on the aircraft or any flying aircraft for safety reasons. I sustained a injury to my lower left leg with the TrainStar at full throttle with the propeller cutting into my leg. This happened in my apartment when testing a safety feature on my RC Radio which when switching off the radio the plane kept going at full throttle. So while my leg was bleeding away I managed to disconnect the battery which turned shut down the engine. I then attended to my wound which required sutures at the local Hospital ED Ward. After that experience, and given I have studied nursing in the past I thought why not make the TrainStar look like a medic aircraft...or have that appearance even though it's probably one of a kind. Not long back I purchased a new FrSky Taranis 9D Plus radio from HobbyKing which I have been learning how it functions. Today I invested in two new FrSky Receivers from HobbyKing which will be installed into my two RC aircraft being the TrainStar 1400mm and a EasyTrainer 1280mm glider that I brought at a local RC shop. In the meantime I am practising flying RC aircraft on my RealFlight8 sim which at first I was crashing a lot...but using the reset function to get airborne again which is cheaper than doing a major repair ect. It also has helped me to understand how my Taranis 9D radio works too which has been good. So I am only new but getting educated as I go. Great stuff! Fast spinning props do get ones attention when they contact flesh! 20 months ago a rather sharp 17inch carbon fibre prop did its best to try and disconnect me from my left little finger! Haha! The irony was I was actually reaching for the safety switch of the large multicopter I was just completing dynamically balancing those props on! All mended now after whole lot of surgery to repair it as best the great NHS surgeons could and physio. Was great to get flying again - sounds like you should be too soon!